Hope you all had a great weekend! Here’s what’s coming up this week. Grade 7 Bake Sale: The grade 7’s are hosting a bake sale this Wednesday January 30th at lunch time just outside the theatre. All proceeds will go towards Camp! New Online Store: There will be an online store launching on January 26th for our school community to purchase Stafford Swag (see the above link). It will be open for two weeks until it closes! All items have minimal markups to get as many students into these as possible! Click here to check out what’s available. 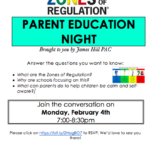 Zones of Regulation Parent Night: James Hill Elementary is putting on a Zones of Regulation parent education night on February 4thto teach parents how they can support self-regulation and self-awareness at home (aligning with Zones of Regulation across the LSS family).